I'm sick of apocalyptic zombie stories. If I read one more survival/siege story where everyone dies at the end or one lone character is left contemplating their last bullet while the undead claw at the door, I may very well resort to bestial cannibalism myself. The end of the world bores me. What I'm interested in is the question of what happens to those who, by some miracle or blind idiot luck, manage to survive it. Mira Grant's Feed seems to be proof that she can read my mind, gifting us with a story that starts a full generation after the undead uprising, seen through the eyes of those who have never known a world where the dead didn't get right back up and start chewing on the living. In the course of doing so, she has written what is, in my humble opinion, the best zombie novel since the one by that Brooks fella. It all started well-intentioned enough: someone had created a cure for cancer and someone else had created a cure for the common cold. Unfortunately, the two virally based cures interbred to create a new virus that irrevocably changed the way we live and the way we die. But that was twenty years ago. Now, Georgia and Shaun Mason are the first bloggers to be hand picked to follow a presidential candidate as his campaign is plagued with tragedy upon tragedy (read: dead people keep attacking it). When they discover the truth behind these attacks, they stumble onto the most important story since the Rising but rooting out the truth will cost them more than they bargained for. 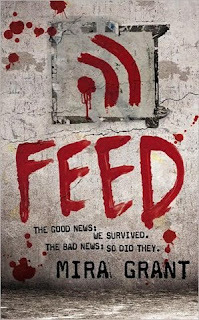 Feed is a relentless monster, an amalgamation of science fiction, medical mystery and political thriller with dead things. More important than the dead things, though, are the live ones. Contrary to the overuse of the phrase, it's incredibly rare to come across characters in a story that truly come alive, that feel like people who could actually exist, but when it happens it is something magical. During the short time this book took over my life, the Masons became a part of me, as did many of the ancillary characters. When the inevitable losses occurred, they were felt and I grieved. 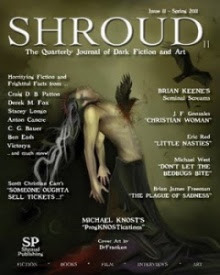 Mira is obviously a writer who understands that horror doesn't come from the monsters themselves, but how they affect the characters and she wields it like a rapier aimed at the heart of the reader. Further, I appreciate the way she approaches the subtext of zombies as an allegory for the constant and meticulously maintained state of terror in post-9/11 America. Feed, at its core, is about journalism or, more pointedly, about what journalists should be doing that they decidedly are not. She approaches this with a passion and rage that sings off the page and burns into the mind of the reader. Also, the use of "Fictionals" in conjunction with straight news is intriguing, underlining the idea that fiction can, in its own way, provide as much truth as fact. Sometimes more so, by digging at the emotional and psychological roots beneath raw facts. Feed holds its own as a politically motivated sci-fi thriller, moving along at a tight clip with its fair share of surprising but perfectly reasonable twists (no cheap shots here) without losing its heart as a story about people doing their best to bring the truth to the masses. Plus, there are zombies. I'm practically giddy with anticipation for the other two parts of the Newsflesh trilogy to come out. Visit http://www.miragrant.com/. Buy it today.